Aveda’s new Smooth Infusion Re-texturizing System, now available as a salon treatment at Geiko, is a versatile thermal straightening system that permanently softens, smooths or completely straightens the hair. Three techniques are used for the perfect finished result – Straight, Control Body and Control Curl – making this more versatile than other traditional straightening systems. Lasts for months with proper maintenance. Contains a minimum of 74% naturally derived ingredients with conditioning organic botanicals. No post-service odour! Organic ylang ylang nourishes the senses eliminating all traces of post-service odour. Can be used on colour-treated, highlighted and chemically processed hair (excluding hair that has been previously treated with a sodium hydroxide relaxer). Please contact the salon to book your consultation today and get the hair you love – permanently! 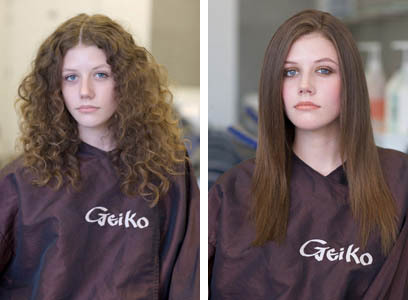 The straightening system at Geiko quite simply transformed my hair. For years I’d struggled to manage my wavy hair which frizzed at the sight of rain. Not to mention the two hours of blow drying and ceramic straightening every time I washed it. It was the bane of my life and I dreamed of straight, glossy hair which I thought was unattainable. Then I was introduced to the permanent straightening at Geiko. I had a treatment beforehand to strengthen my hair and prevent it from being damaged, and then the process took about 4 hours. The results were truly amazing. I can’t imagine life without it! It’s worth every penny and I’d recommend it to anyone who can relate to my story.